In 1944, as part of Operation Bagration, the Red Army established a bridgehead at Magnuszew, (at times also called the Warka bridgehead). Heavy fighting between Soviet and German forces occurred when the bridgehead was established, and even more fighting occurred in January 1945 when the Red Army broke out of the bridgehead heading for Berlin. The Panzer Leader series covers the key battles that took place as the Germans tried to eliminate the Soviet bridgehead west of the Vistula, to include the tank battle of Ogledow where the German King Tiger was first introduced. Map Mission Listing - Click on the picture of the map to see the missions listed for that map. Installation: Extract the .IFA file(s) to your C:\Program Files\Iron Front - Liberation 1944\mpmissions folder. Between 5-9 Aug 1944, the situation at Baranov was critical. There was only one division - the 24th Panzer Division which was severely depleted - that was in a position to delay the Russian's as they advanced west of the San river and west out of the Baranov Bridgehead. This scenario depicts their later stages of the battle to retake the Anytuno airfield at dusk as the 24th tried to battle to delay the Russian advance to buy time for the 3rd Panzer Corps and the German 7th Army to move into position. Between 5-9 Aug 1944, the situation at Baranov was critical. There was only one division - the 24th Panzer Division which was severely depleted - that was in a position to delay the Russian's as they advanced west of the San river and west out of the Baranov Bridgehead. This scenario depicts their initial contact with the Soviet defenses as the 24th tried to battle to delay the Russian advance to buy time for the 3rd Panzer Coprs and the German 7th Army to move into position. The three following scenarios continue the battle through the day and into the evening. The Battle of Brody took place from 13-22 July 1944. It was the most significant military action fought by the 14th Waffen SS Galicia (Ukraine) Division, and other encircled German units to include the 8th Panzer Division. The 13th Army Corps was hopelessly outnumbered, more than 2:1 in men and 3:1 in armor and materiel. The 14th Waffen SS was ordered to plug the hole in the front at Brody. The Division faced a Soviet force that was several times stronger. On 18 July the Division was surrounded, but on 21-22 July along with elements of the 8th Panzer Division, broke out of the encirclement. Near the town of Koltov the Soviet infantry created a 6 kilometer wide gap thru the German lines. The Germans heavily attrited the Soviet Infantry Divisions trying to maintain the gap in order to commit the Tank Divisions of 4th Tank Army. The Germans launched a series of counter attacks between 16th – 18th July in an attempt to cut the Kolotv Corridor. The 322nd Rifle Division barely held the corridor open against attacks by the 1st and 8th Panzer Divisions as well as the SS “Galicia” Ukraine Grenadier Division. The 93rd Separate Tank Regiment and the 72nd Guards Heavy Tank Regiment will come to the rescue! This scenario depicts the supporting attack during the Ogledow battle made by other elements of the 2nd Panzer Regiment and 79th Panzer Grenadier regiment east out of the village of Kurozweki. Like the German units moving south of Ogledow, the 2nd Panzer units moving east out of Kurozweki would be surprised by the strong Russion defenses. While the 52 and 53 Russian Tank Brigade occupied defenses south of Ogledow, the 51st Russian Tank Brigade blocked the 2nd Panzer Regiment's supporting attack out of Kurozweki! Ivan launched a massive offensive across the Ukraine and Eastern Poland that ended in the seizure of bridgeheads on the western bank of the Vistula River in the region of Sandomierz. The Germans sent the 16th Panzer Division with the 501st Heavy Panzer Battalion and its new King Tigers to reduce the bridgehead in the vicinity of Staszow. Their first attempt meeting the 52nd and 53rd Tank Brigades at Ogledow failed. They regrouped north of Szydlow and now will make another drive toward Ogledow from Hill 272, north of Mokre. Ivan launched a massive offensive across the Ukraine and Eastern Poland that ended in the seizure of bridgeheads on the western bank of the Vistula River in the region of Sandomierz. The Germans sent the 16th Panzer Division with the 501st Heavy Panzer Battalion and its new King Tigers to reduce the bridgehead in the vicinity of Staszow. The Germans would face the 52nd and 53rd Tank Brigades of the Soviet 6th Guards Tank Corps and the 294th Infantry Regiment, 97th Division. The King Tigers would receive their first baptism of fire south of Ogledow! 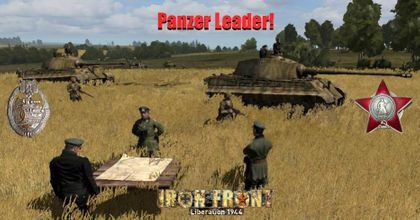 The next two scenarios depict the 2nd Panzer Regiment and 79th Grenadier Regiment supporting attacks that took place simultaneously to the Ogledow battle. 9-16 Aug 1944, 2nd Tank Army was launched through the breach in the German 4th Panzer Army's to find a crossing over the Vistula. In this it was supported by the Polish First Army, including the Polish 1st Armoured Brigade. At the point where the Army was able to occupy the Magnuszew brideghead, the Polish brigade engaged the counter-attacking German Fallschirm-Panzer Division 1 Hermann Göring with the express orders to deny Vistula crossings to the Red Army. The Soviet and Polish forces held the bridgehead, and German forces suffered heavy casualties before withdrawing. 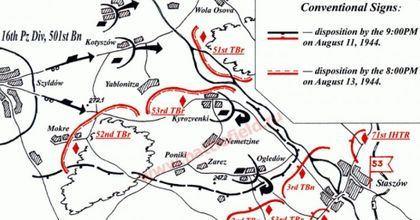 This scenario uses the Staszow map to simulate this battle. On 12 Jan 1945, a large invasion force of 163 divisions with a total of 2,203,000 men, 4,529 tanks, 2,513 self-propelled guns, and 13,763 artillery pieces, supported by about 5,000 aircraft, was launched for the Vistula-Oder Offensive. The first attack in the offensive took place at 0435 hours on 12 Jan with Soviet 1st Ukrainian Front forces attacking out of the bridgehead at Baranów, Poland against positions held by troops of XLVIII Panzer Corps of German 4th Panzer Army. This scenario depicts the early morning attack on the 16th Panzer Division near Szydlow. This scenario depicts the supporting attack during the Ogledow battle made by other elements of the 2nd Panzer Regiment and 79th Panzer Grenadier regiment east out of the village of Kotuszow. Like the German units moving south of Ogledow, the 2nd Panzer units moving east out of Kotuszow would be surprised by the strong Russion defenses. While the 52 and 53 Russian Tank Brigade occupied defenses south of Ogledow, the 51st Russian Tank Brigade blocked the 2nd Panzer Regiment's supporting attack out of Kotuszow! Between 5-9 Aug 1944, the situation at Baranov was critical. There was only one division - the 24th Panzer Division which was severely depleted - that was in a position to delay the Russian's as they advanced west of the San river and west out of the Baranov Bridgehead. This scenario depicts their later stages of the battle well into the night as the 24th tried to delay the Russian advance to buy time for the 3rd Panzer Corps and the German 7th Army to move into position.